An Access Code is an 8-character code that gives you either a discount when signing up for Core Grammar for Lawyers or allows you to activate an account without needing to enter a credit card number. If the code you are trying to enter looks like a phone number or a social security number, e.g., 123-45-678, that number is not an Access Code. That number is a Class Code (see below) that adds you to an Instructor's class. During the Core Grammar for Lawyers purchase process, a temporary authorization charge for $1.00 is placed on your debit or credit card. If you do not complete the purchase section, this authorization is cancelled and should disappear from your debit or or credit card statement within a few days (the exact length of time depends on your bank). A Class Code is a code that your teacher generates that allows your Instructor to view your progress through Core Grammar for Lawyers. A Class Code looks like a phone number or a social security number, e.g., 123-45-678. You may enter in your Class Code when you create your account, or at any time afterwards by going to the My Account page. What do I do with my Class Code? 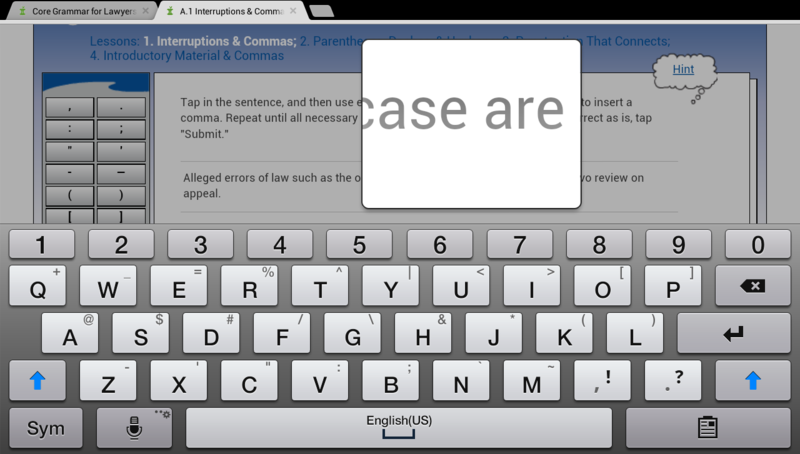 Log in to Core Grammar for Lawyers. Click the "Edit Account Information" button. Enter your code in the "Class Code (optional)" box. I entered the wrong Class Code, or I switched classes and have a new Class Code. That's OK, you can change your Class Code at any time through the My Account page. See the above question for more information. If the reset email does not arrive within 5 minutes, please check your spam folder. I forgot what email address I used to subscribe. Do you have your original Welcome email? The subject line is "Core Grammar for Lawyers - Welcome". If you do not have your Welcome email, you may contact us at support@coregrammar.com. Please include your full name, your school, and what your login email address should be. I spelled my email address wrong when I created my account. If you can still log in to Core Grammar for Lawyers, you may modify your email address on the My Account page. If you are not able to log in, you may contact us at support@coregrammar.com. Please include your full name, your school, and what your login email address should be. I would like to renew my account. Can I use my keyboard to answer Exercise questions? Here is a list of keyboard shortcuts that can be used when answering Exercise questions. I can see the Exercise questions, but nothing happens when I click the buttons in the question. When I try to start a Lesson, nothing happens, or a blank window appears. In order to view Lessons, you must be using a supported web browser. Apple iPads running iOS 9.1 or higher and the Safari browser. Android Tablets running the Android KitKat 4.4 or higher operating system and the Google Chrome browser. I'm answering the Exercise questions at the end of the Lesson but keep getting them wrong. Make sure that you follow the instructions for each type of questions. Many questions require you to insert words or punctuation into a sentence and will be marked incorrect if the spacing and placement are not exactly correct. If you need additional help with the question, you may review the Lesson at any time. Will Core Grammar for Lawyers work on my Tablet? I'm having trouble answering some Exercise questions on my tablet. When you are asked to insert punctuation marks, first tap in the sentence where the mark should go. You will see a blue insertion cursor appear in the sentence. Once you see this cursor, you maybe find it helpful to tap and hold your finger down over the cursor. A small magnification circle will appear that allows you to precisely move the blue insertion cursor around. Slowly slide your finger in the direction you want the cursor to move. The cursor and the magnification circle follow your finger. When you are asked to insert punctuation marks, first tap in the sentence where the mark should go. You will see a magnification box appear. Tap again within the box to select where the insertion cursor should be. You should now see an insertion cursor in the sentence. You may now type the punctuation using the keyboard or select the proper mark from the palette to the left. My on-screen keyboard does not have all the necessary keys. You do not ever have to use the keyboard to type special characters. 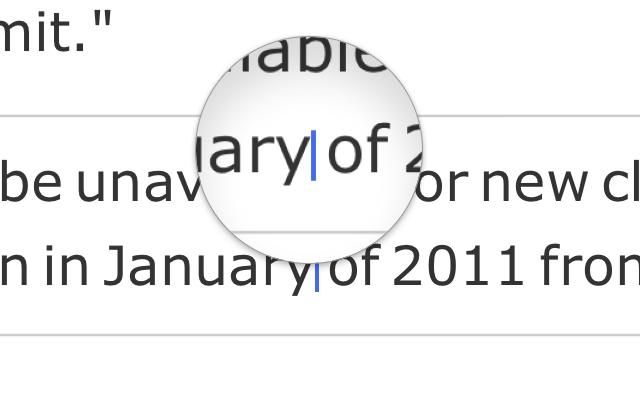 You can always access the necessary punctuation marks (e.g., commas, periods, dashes, etc.) or words through the CGL palette that appears to the left of every exercise question. Android Tablets support third-party keyboards. These keyboards may enable you to access more punctuation marks or include a tab key that allows you to move your cursor between words. These keyboards should work with Core Grammar for Lawyers but are not officially supported. If your question isn't answered here, you may email us at support@coregrammar.com. We aim to respond within two business days. Please be sure to include your name and the email address on your account. If you are having a technical difficulty, please copy and paste the entire contents of the "System Specifics" box (below) into your email.